Addressing questions of loss and damage from climate change in courts is limited by many scientific, legal and political challenges. However, modifying existing extreme event attribution frameworks to resolve the evolution of the impacts of climate change over time will improve our understanding of the largest scientific uncertainties. Loss and damage from anthropogenic climate change has been formally realised in the Paris Agreement of 2015 as a third pillar of climate change action next to adaptation and mitigation (Paris_Agreement_text 2018). However, political obstacles have resulted in intergovernmental compensation measures being explicitly excluded as a means of addressing loss and damage (Paris_Agreement_text 2018). Consequently, the prospect of litigation being used as a tool to pursue damages against fossil fuel companies is being examined increasingly within the legal research community (Marjanac et al. 2017). Alongside these research efforts, the scientific basis for linking the observed impacts of climate-related events to human influences continues to develop rapidly. These scientific developments are considered potentially highly relevant to tort law suits which might deal with financial losses from an extreme weather event which has been exacerbated by human-induced changes to the climate system (Marjanac and Patton 2018). However, many obstacles currently limit the extent to which this legal pathway can be utilised. First, immense scientific challenges exist in quantifying what monetary losses from a specific weather event can be explicitly linked back to cumulative carbon dioxide emissions from individual fossil fuel producers (Stott et al. 2016; Skeie et al. 2017; Otto et al. 2017). Second, there are numerous other, largely non-scientific, difficulties which exist in being able to quantify the estimated cost of liable damages for an individual fossil fuel company—one example lies in whether a company carries culpability for those emissions which occurred prior to scientific consensus on the role of anthropogenic greenhouse gas emissions modifying the climate system (Thornton and Covington 2016). Regardless of these still outstanding challenges, several suits have been recently filed aiming to hold specific fossil fuel producers responsible for damages from climatic events. In the absence of specific scientific analyses attributing damages to specific parties, plaintiffs in these examples have applied the ‘market share theory’ (Marjanac and Patton 2018; United Nations Environment Programme 2017), positing that the company’s liable costs are equal to their fractional contribution to cumulative carbon dioxide (CO2) emissions globally (Heede 2014), multiplied by the added damages due to climate change. Crucially, this theory relies on several testable assumptions, one of which is the inference that attributable climate change impacts increase linearly with cumulative carbon emissions. While some aspects of regional climate change appear to emerge linearly with warming (Wartenburger et al. 2017), many studies have also presented examples of climate change impacts which show non-linear responses to rising global temperatures (and thus cumulative CO2 emissions). For those types of impacts which exhibit non-linear responses, two shapes of impact trajectories appear to dominate: quasi-exponential increases (that is, following Tk where 1 < k < 2) (Revesz et al. 2014) and sigmoidal patterns of change (Ricke et al. 2016). Of particular relevance in the context of loss and damage claims from changing climate extremes, the severity of extreme short-term precipitation rates is projected to accelerate with continued warming, approximately following the Clausius-Clapeyron relation of 7% per degree of warming (Fischer and Knutti 2016)—although evidence also suggests even faster changes for the types of sub-daily convective rainfall extremes which can be most damaging (Zhang et al. 2017). Ricke and colleagues (Ricke et al. 2016) have noted that many other specific impacts (like coral reef bleaching) follow a sigmoidal pattern of response, whereby the magnitude of change occurs rapidly with some amount of initial global warming, followed by progressively fewer additional changes after the exceedance of some threshold (since fewer healthy reefs remain to suffer subsequent temperature rises). Evidence also suggests that the evolution of the fraction of attributable risk associated with some specific extreme weather events will follow this saturation pathway (King et al. 2016; Harrington and Otto 2018). While there will be impacts that behave differently, if warming increases to the point that every new event will be more severe than some historical definition of ‘extreme’, then the percentage of damages from any of these new events which can be attributed to the underlying warming signal will often converge towards 100% (Christiansen 2015). To demonstrate the effect of non-linearity in the manifestation of climate change impacts on liable cost estimates for a fossil fuel company, we first make an assumption that some specific instance of economic loss, either in the present day or near future, is attributable and known. Given this assumption, Fig. 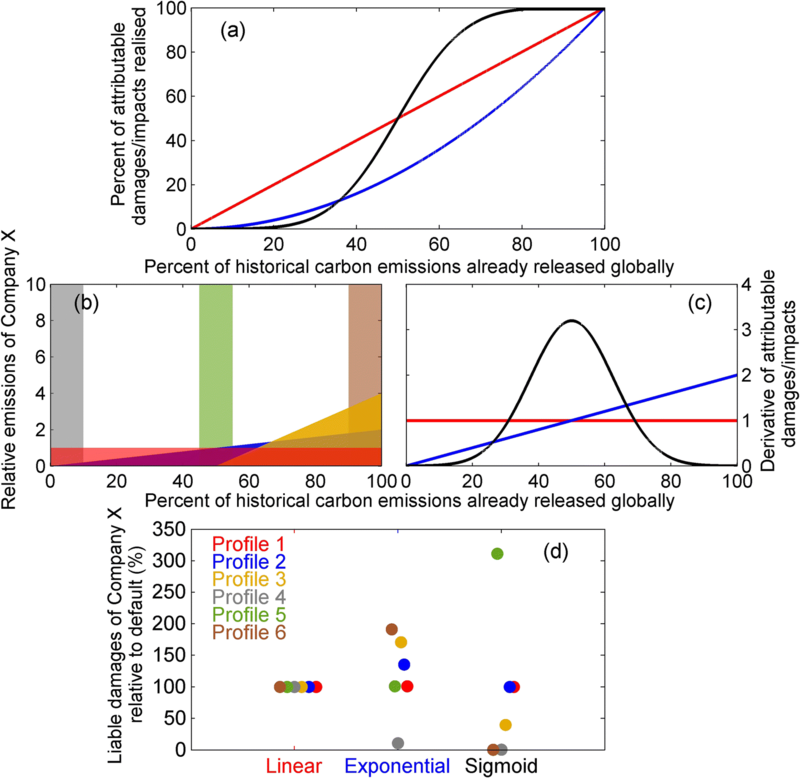 1a then presents three idealised profiles of the evolution of these attributable losses as a function of cumulative carbon emissions: a linear, an exponential and a sigmoidal pattern. Figure 1b then presents a range of plausible emissions profiles for an individual company (Heede 2014), presented as emission rates relative to the corresponding accumulation of all carbon emissions globally. The default profile is one where the emission rates of an individual company remain constant relative to the corresponding accumulation rates of everyone else (red shading). Two variations have emissions increasing two (blue shading) and four (yellow shading) times faster than the global average, but with different start dates to ensure that the same cumulative emissions are produced. The remaining three scenarios consider a company’s full carbon emission profile which is released in bulk at the beginning, middle and end of the period over which cumulative carbon emissions have occurred globally. We emphasise here that, in the context of relative damage liability, the rate of change of cumulative emissions through time (for either global or company-specific cumulative emissions) is not relevant. Instead, we are interested in how the emission profile of the company evolves relative to the corresponding rate of carbon accumulation globally. Cumulative carbon emissions are considered here as CO2 emissions only, as it is these emissions which accumulate in the atmosphere and thus map most closely to corresponding increases in global mean warming (Allen et al. 2009). The inclusion of other non-CO2 climate pollutants will affect the fractional contribution of a company’s emissions to all emissions globally (Skeie et al. 2017) (the profiles in Fig. 1b), but will not change the qualitative shape of the relationships between cumulative emissions and impacts in Fig. 1a. For those few suits which have been filed to date (United Nations Environment Programme 2017), the fraction of damages for which a company has been considered liable has been proposed as proportional to the fractional contribution of that company towards cumulative emissions globally. To understand the potential variations which could emerge relative to this default framework, we assume the climate change–related damages which can be apportioned to a specific fossil fuel producer equals to the fractional contribution towards global emissions at a given time step (Fig. 1b), multiplied by the corresponding increase in attributable damages over that same time step (Fig. 1c), taking the sum across all time steps then yields an ‘attributable damage’ estimate for that company. As shown in Fig. 1d, when either the emissions profile of the company is linear (relative to the corresponding accumulation of emissions globally) or if the accumulation of impacts with warming is linear, then the ‘liable damage’ estimates of our hypothetical company remain unchanged. However, if nonlinearities are found in both the impact profile and the relative emissions profile in the company, even very small ones, then the liable damage estimates can vary dramatically. For the case of a quasi-exponential impacts profile, those companies which have recent emissions outpacing global emission rates (such as fossil fuel producers from emerging economies (Heede 2014)) yield increases in attributable damages up to twice as high. Meanwhile, the rate of change of impacts under a sigmodal trajectory can vary quite dramatically through time (Fig. 1c); hence, depending on when the company’s emissions are released, their attributable damage liability can be as low as 0.5% or up to 320% relative to the estimates using linear profiles. While the historical emission profiles of the largest fossil fuel producers are largely well-quantified (Heede 2014), the trajectories that emergent climate change impacts will follow with rising cumulative emissions are not. Figure 1 shows that understanding the evolution of these changes will be crucial, not only to assigning responsibility for damages to specific fossil fuel producers, but also for understanding future challenges for climate change adaptation. Specific research priorities include understanding to what extent different types of climate change impacts can deviate from the assumption of a linear response to warming, as well as whether the qualitative shape of impact profiles is sensitive to the baseline period from which we consider changes (Hawkins et al. 2017). This is particularly relevant if the science of probabilistic event attribution is to inform legal proceedings relating to the proximate cause of adverse climate change impacts (United Nations Environment Programme 2017). Attribution studies of specific extreme events in the present day largely consider a binary factual-counterfactual modelling framework: this could be thought of as identifying only a specific point in Fig. 1a. However, resolving the full trajectories of Fig. 1a instead requires an understanding of how the risks of extreme weather events evolve with warming, both in the past as well as into the future. Consequently, event attribution frameworks need to be modified to answer new types of questions: for example, how the uncertainty of historical observations limits our understanding of past changes in the frequency of extreme event damages, how the shape of future impact trajectories might be affected by different emission pathways (Samset et al. 2018) and how any potential tipping points in the manifestation of regional climate change impacts could be interpreted within the ‘Fraction of Attributable Risk’ framework. These questions are also highly relevant for climate change–related decision-making in general, and particularly understanding how the characteristics of climate hazards are projected to change through the twenty-first century. The legal system is being increasingly employed as a tool to address the issue of climate change and justice. 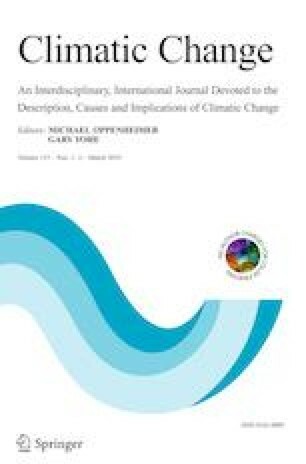 While climate litigation and the scientific attribution of climate change impacts are often explored without explicit reference to each other, emerging trends in different categories of climate change litigation suggest that the role of science will only become more important in the future (Marjanac et al. 2017; Marjanac and Patton 2018; United Nations Environment Programme 2017; McCormick et al. 2017). Simple adjustments to research priorities and methodological frameworks today can help to ensure the relevant scientific evidence is available to support decisions made over the coming decades.